This is the new hat I got today while out thrift shopping with my grandma! Can you believe it was only seven dollars?! The only thing wrong with it, which is very slight, is a rip in the veil, but it isn't too big. This hat actually goes quite well with a vinatge pokadot dress I have; I would have taken pictures if it hadn't been below zero out today! Above are pictures of a book I got at the Library today about 1950's fashion. It is quite interesting; it shows different styles of clothing for men, women,and children, and also about how much each item would cost. I think the little girl dresses are some of the most adorable things I've ever seen in my life.. The sailor dress in the picture above is especially just too cute!! Along with the books, I also rented Breakfast At Tiffiany's, which I will hopefully get to watch before my winter break is over! 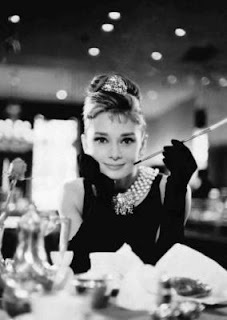 For decades, Audrey Hepburn's style in Breakfast At Tiffany's and in real life has been admired by millions of girls and women. Maybe it was her sophisticated manner, her classy style, or perhaps it was her natural beauty... Here are some of the important aspects and pieces of clothing that make Audrey Hepburn the girl we all wish we could be! Clean lines and simple siloutes were the key. Less was always more for Audrey. Audrey knew exactly what she wanted, and knew what looked good on her body. Since she was tall and thin, she didn't buy clothes that flattered the popular curvy shapes of Marilyn Moroe and Elizabeth Taylor. Intead she bought clothes that looked good on her shape. Manners were very impotant. The key to being classy for Audrey was to always behave and act like a lady. Along with good manners, posture was big aspect in Audrey's style. 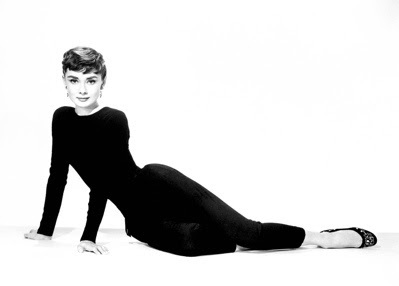 Before she was an actress, Audrey was actually a ballet dancer, which gave her good posture. Comfort came first before looking good in the eyes of Audrey. She would never be sacrifice being in pain for looking good. Makeup was never used to hide Audrey's true beauty, which shone quite naturally. Mostly she focused on bringing out her eyes, by lining her top lids with black eye liner and winging it out at the ends. Not only was makeup simple for Audrey, but she kept her hair simple and chic as well. In most pictures, Audrey is seen with her iconic short pixie cut.
" I never think of myself as an icon. What is in other people's minds is not in my mind. I just do my thing." Pink Trench Coat: (Christmas) Kohl's. Black T-Strap Heels: (Christmas) Target. Here is the lovely trench coat I got yesterday, I just can't get enough of it! This wasn't the outfit I wore today, but it's going to be Thursday's. Although it's still Winter Break, I have alot of homework to do, so I figured since I was doing it today there was no reason to dress up that much! Also, in the pictures I didn't wear the shoes that I have a close up of. I got the shoes above for Christmas, and they are my absolute new favorite pair!! I didn't want to get my babies all banged up, so instead I just wore my old T-Straps for the pictures. 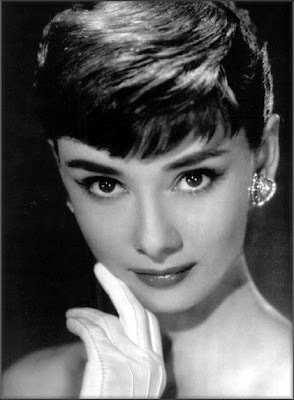 Later I'm planning on doing another post on Audrey Hepburn, so watch for it! Black Open Front Cardigan: (Christmas) Forever21. Sorry for the poor quality photos, what a blustery and snowy day it has been! The weather made it impossible to get any good photos,so I tried taking a few upcloses of some pieces. 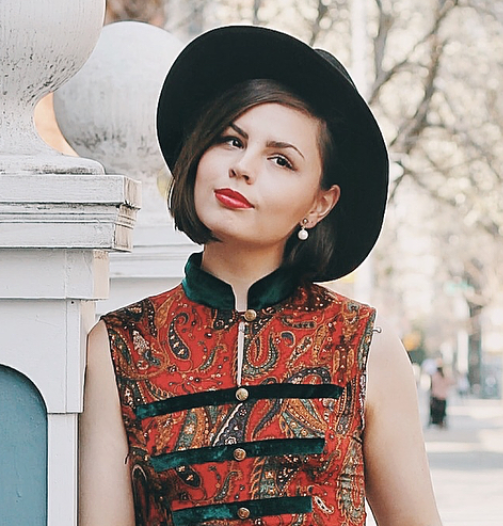 I was so disappointed when I put together the PERFECT outfit this morning...it was the new vintage dress I got for Christmas, mentioned in the previous post. Unfortunately, it was not too practical of an outfit; short sleeves, knee socks, heels..yeah, not too smart to wear in the middle of a snow storm. So very relectatly I put away that outfit, to perhaps save for a day that is not so winter weather filled! The outfit above was the replacement of the first, and although I quite liked it, it still wasn't as perfect as the oringinal ensemble. Oh well, I probably saved myself alot of frostbite.. My mother, sister, grandma, and I ventured out into the blizzard to do a bit of shopping today, mostly just returns. I did though get a few things with the money from returning a coat from Kohl's! One was actually a thing I've been subconsciously wanting: A new pair of skinny jeans! I just noticed the other day that almost all of my skinny jeans have a peculiar faded mark on the right knee...I must bend down on that one alot? Anyways, I thought it would be a good idea to get a new pair. 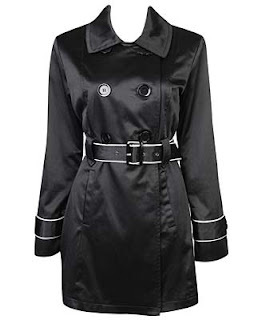 Also, I picked up a darling little trench coat that I had my eyes on a few weeks back. Although it was by the Candies Brand, not usually my thing, I really have a sweet spot for this piece. 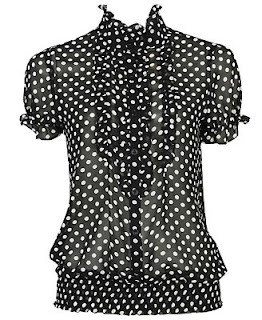 It's light pink with black pipping along the sleeves and bottom, and also has black buttons. A snazzy black belt cinches the waist to add the finishing touch! It's long sleeve to boot, making it even better for winter weather! Along with wanting to do a million outfit posts right now, I've been itching to do a post on the beautiful Audrey Hepburn. Lately I've been gathering information and pictures, so I should be doing a post pretty soon! Striped 1950's Skirt: (Christmas) Vintage. Red 1950's Brimmed Hat: (Christmas) Vintage. Black T-strap Heels: Gabriel Brother's. Merry Belated Christmas! I disappeared from my blog for a few days because with Christmas going on I was just so busy! I am back now though, with tons of wonderful things to blog about! Namely, these pictures above! For Christmas, my parents got me this beautiful vintage 1950's stripped skirt that is to die for! It's made of this satin like material, and has multicolored strips running horizontally. I had seen it quite a few months back when my father and I took a trip to the vintage store in Plymouth. I hoped ever since then that next time I saw it that it would be mine! The hat is vintage 1950's as well, bought at a local antique store for Christmas from my parents. This hat is exquisite!! A funny little story goes along with hat.. I saw it while thrift shopping with my grandparents and fell in love with it. I went back to the place to show my mother a few days after that, and it was gone! I asked the shop owner about the hat, and he had said someone had bought it. Although I was very disappointed I told myself to try and forget about the hat. Imagine my surprise though on Christmas morning when I opened up a box and it's there! I tell you, I was overcome with surprise and happiness! Another 1950's Vintage Dress! 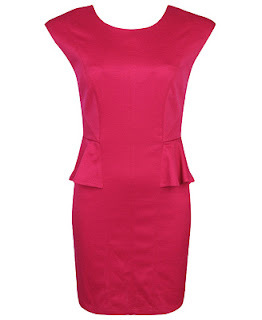 It has light pink and grey strips, and a gorgeous silhouette! A Pill Box Hat from the 1960's. So adorable with a bow on the front, and a veil coming out from the top! Remeber that Minnie Mouse post? I recieved the sweatshirt that I had a picture of, and also the poka dot tights! I can't wait to take pictures.. So much more than even what I listed; leopard flats, satin purple heels, striking scarfs, a purple quilted purse, and a dress that may look vintage, but isn't! There will be no shortage of posts in the near future! Just the outfit I wore today. All dressed up and no where to go, ha seems to me that's the story of my life! I love the last picture I took, even though it was rather painful...I took some snow and threw it up into the air, the result looks pretty cool! Only 4 more days until Christmas! Black Bow Dress: Gabriel Brother's. Black T-strap Wedges: Gabriel Brother's. This afternoon I also watched my favorite Christmas movie, a tradition to watch every Christmas season, The Grinch! I watch every year both the Jim Carey movie, and the original animated one by Dr. Suess, but today I watched the Jim Carey one. I still enjoy watching it and get a laugh at all the silliness! Lauren the Elf loves making toys...And Christmas Break! Hat: Gift from when I was in grade school! Today was absolutely, positively one of the best last days of school before break that I've ever had! Haha maybe looking like an elf added to it? I had so much fun with this outfit( as you can see from the silly pictures, like the one of me "making" a chair! :)) Other than my festive Christmas outfit, I enjoyed the day because of the utter nonsense of doing nothing, and eatting so many sweets until I felt sick! In Spanish we watched the Grinch, is espanol of course! Chemistry was actually( gasp!) fun for once! We made pretty designs on filter paper, and then had water soak them so that the colors blurred together, but end up looking beautiful! Also, in band we watched the movie Elf, which is such a classic and so much fun to watch! All of our classes were shortened, for at the end of the day there was a wonderful holiday assembly! Last year I did not get to see it, for we had a snow day on the day before Christmas break and didn't go to school. Watching it for the first time was fantastic though, and I had a blast! Many of the different choir groups sang fun tunes, and of course a traditional song always sung since I was in Kindergarten; called Fruitcake! It's still everyone's favorite, even as highschoolers! The teaching staff also did funny skits poking fun at us kids and the stupid things we ask sometimes. It was hilarious! They also sand the " 12 Days of Christmas," but a teacher version. Here a few of the lines that I remember, "one teacher in a classroom, two principles, three bunsen burners,four lab rats, five tangent rules, six noble gases, seven cookies baking, eight schedules changing, nine crepes a' flippin..." Can't remember the rest! The teacher put on a little skit also about the "5 things the seniors gripe most about!" Which was by the way one of the funniest things I've ever seen! Finally,the jazz band played the tunes to end the show, and with that my Christmas Break official began! Tomorrow is the last day of school before break; hooray! We have a Christmas assembly, so our classes will be shortened, making the day go by even more fast. Tomorrow will also be great because I have no test/quizzes! It's easy sailing from here on out.